Reservations Required | How to Book: The TOTAL number of slots available per tour are indicated by clicking on the Adult Ages 17+ drop down box. If for example, the Adult drop down box states 2 slots available and the Child states 2, there are ONLY a TOTAL of 2 tours available for that time slot. If there are no tours for the date | time you search, you will get this message: NO RESULTS FOUND. Please change your dates and check other availability. Reservations for the Delta -01 tour can be made between 24 hours and 90 days prior to arrival. Reservations inside 24 hours and same day reservations are not available. Only six people allowed per tour. Child must be accompanied by an adult. Children must be 40” tall and at least six years old. 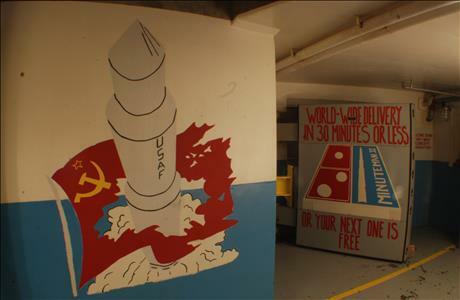 Visit the once secret facilities where Air Force personnel controlled and maintained ten nuclear missiles, part of a force of 150 missiles located in South Dakota. Discover the Cold War events that shaped our lives and still remain through a tour of the underground control center at Delta-01. At the Delta-09 silo, view a nuclear missile which once carried a 1.2 megaton warhead. Minuteman Missile National Historic Site is located at three sites along a fifteen mile stretch of Interstate 90 in western South Dakota. The Visitor Center is located immediately north of I-90, exit 131. The Launch Control Facility Delta-01 (reservations required) is four miles west and the Delta-09 missile silo self guided tour is 15 miles west of the Visitor Center. To see Delta-01, visitors need to attend a ticketed ranger-guided tour. The forty five-minute ranger guided interpretive tour of Launch Control Facility Delta-01 begins with a walk through of the grounds and topside support building. Visitors will see the living, dining, and recreational areas for the eight people stationed on the topside at Delta-01, working three days on and three days off at a time. Visitors then descend via an elevator 31 feet underground. They enter the Launch Control Center by walking past an eight ton blast door built to protect missile crews from the effects of a nuclear blast. 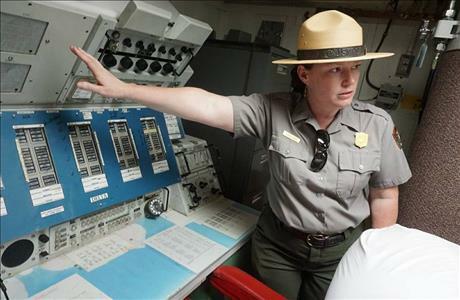 Visitors will see the complicated array of electronics used by missileers during their alert shifts to monitor the missiles and learn what it was like to have the awesome responsibility of thermonuclear war at their fingertips. Be physically capable of climbing two 15 foot ladders unassisted. These ladders are permanently attached to the wall and are very sturdy. Children must be at least 40” tall, six years of age, and be able to climb the ladder unassisted. - At least one adult must accompany child on Delta-01 Tour. Be comfortable in a small elevator in close proximity to six other adults. Be comfortable with heights of approximately 35 feet or about 3 stories. The elevator door is an open grate, not a solid door. The underground control center was not designed to accommodate the general public. It is accessed by an elevator and a ladder. In the event of an elevator failure, visitors that are underground will need to be capable of climbing the ladder for a safe and timely exit. 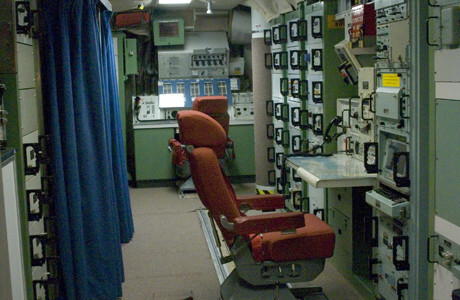 Entering the control center also requires passing through a narrow corridor. Why only six per tour? Because the facility was built for nuclear war. A small elevator and tight space.